Alms Box. Iron construction. These boxes were common in churches. Mfg by: German, 17th c.
Alms Box. 6 3/8" high x 3 1/8" diameter. Hand forged iron brazed together. These boxes were common in churches. The box is locked with a period half-heart padlock with original key. Lock measurements: 1 7/8" high x 5/8" wide. 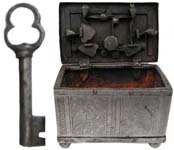 Mfg by: German, 17th c.
Please note that the box is a reproduction and the padlock is original.